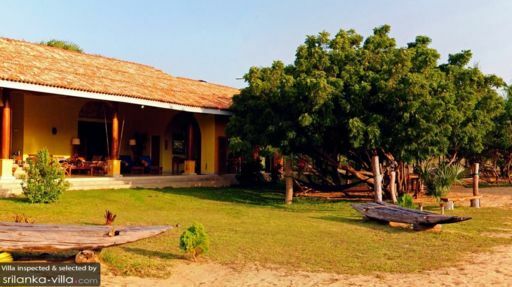 Khomba Beach House in Puttalam on the western coast of Sri Lanka is a beautiful, traditional home with vibrant colours, age-old architecture and design, and a warmth owing to the beach out front! Flush with tropical gardens, flora and fauna that frequent the villa grounds, it is a perfect location for a quiet holiday for couples or small families as it has two, well-equipped bedrooms. Nearby you can indulge in ample water sports, try out local restaurants, and even go whale and dolphin watching for some fun! The splendid landscape with the beckoning ocean, you can rest assured that this holiday would be unlike any other. Two bedrooms grace Khomba Beach House, each designed with Sri Lankan décor and style featuring antique cabinets, a riot of colours, high-soaring ceilings, and large windows for the fresh air to air out the space. The entrance to the master bedroom is through solid wooden doors with a hand-painted lunette above, for a delicate and personal touch the interiors. 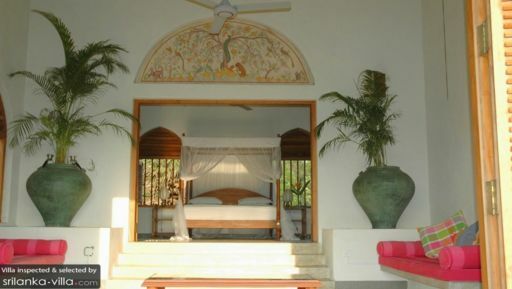 One of the bedrooms is furnished with a king-sized bed and the second is furnished with single beds, each of these three beds is a four-poster with a mosquito net draped lovingly along the bed. The second bedroom even has a corner seating for comfort. There are en-suite bathrooms that are semi open-air with rain showers. 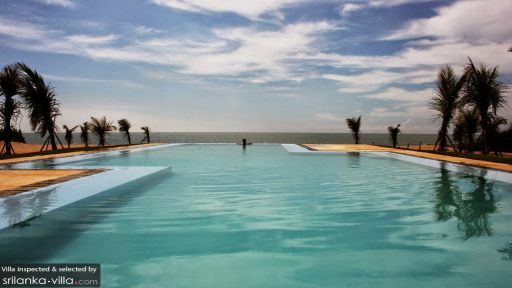 A free-size abstractly shaped swimming pool takes up room in the villa’s outdoor space, and since it is an infinity pool, this is where you will be witness to breathtaking ocean panoramas with the horizon and sun-kissed skies. The beautiful scenery really comes alive once the sun is ready to set, and as you lay back on the recliner chairs found beside the pool, really take in the serene, raw beauty of the nature that surrounds your being. The gardens extend out to meet the sandy shores of the beach, where you’ll find beach chairs, benches etc. There is even a hammock to swing on, perfect for an afternoon nap. With large doorways, shuttered lunettes, and open-concept, the entrance to the living room is nothing short of grandiose. With a plentiful view of the lush, green gardens, the living room is great for simply taking your time to acquaint yourselves with the space, to read a book and lose yourself, and to even spend quality moments with loved ones. Furnished with antique furniture that is comfortable as any other, this yellow and sunny bright room is an instant mood-lifter. High ceilings, open-plan layout and large spaces allow for ample ventilation so you can breathe easy. Towards the other side of the seating area is where you have the dining area at Khomba Beach House which has an eight-seater dining table also set against open doors so you can enjoy the view while enjoying the delicious food. Guests of Khomba Beach House are at an advantage as nearby restaurants like Bar Reef and Palagama have offered their amenities like yoga pool and salt-water infinity pool as well as spa, respectively to them. The villa itself is fully-staffed and looks after cleaning and sprucing up of the house. Massages, car rentals and tours, personal chef for meal preparation, and boat rentals are available at additional costs. At Puttalam, you can never get bored as there is so much to do and if you’re a lover of anything related to water then the activities here including snorkelling, kayaking, kitesurfing, etc. are just right for you. You can even go watch dolphins and whales for a thrilling experience! What a stunning place and the photos don't do it justice. Slightly off the beaten track its a house and grounds offering complete peace, but at the same time you are slowly immersed in the wonderful Sri Lankan culture. It was wonderful to get to know Sisira and Indrani. They couldn't do enough to look after us and the food was the best we had in Sri Lanka. Aside from the fantastic beach (the kids could swim in the sea all day unlike the South with its strong currents), I just loved waking up in the morning with the ceiling fan circulating a cool breeze and looking out to sea to watch the fishermen far far away. A holiday of dreams. My partner and our two young children have holidayed in Sri Lanka before and last time we stayed on the South Coast so we really didn't know anything about Kalpitya and the West Coast. All I can say is that we had an amazing few days. This part of the coast is a well kept secret and getting there is half the adventure. You pass through the dusty local village and see a slice of Sri Lanka that you wouldn't find in the guidebooks. Turning off the red dirt track into Khomba, you enter your own private oasis. The gardens around the house are huge and Sisera, who looks after the place obviously takes great pride in maintaining them, particularly the fish pond which attracts an amazing array of bird life. The kids ran wild and used the house cycles to run to the neighbouring hotel operators to use their pool . Staying in Khomba felt very private. They don’t call this the Wild West for nothing. No traffic, no noise and very little development. Just bird song to wake you up in the morning. The beach was very private with a lovely hut where we spent most of the day staring out over calm seas. Another plus was that the seas are very calm, great for the kids. The beach stretches for miles in either direction and it was breathtaking. The house was perfect. Super comfortable beds and huge airy bedrooms. With open windows we only needed the breeze from fans to keep cool at night and the kids slept on the huge seating space built into each room. Sisera and Indrani, his wife - who does all the cooking, were superb and incredibly attentive. If you want a seafood dinner, Sisera will hop on his bike and come back an hour later with a bag full of fresh crabs, lobster and prawns. Indrani is a fabulous cook. We ate Sri Lankan food every day and marvelled at the array of different curries that she produced from completely unrecognisable vegetables. I was hoping to lose weight this holiday but no such luck. The high point for the kids was going out dolphin watching. After 15 minutes we ran into a school of hundreds of leaping spinner dolphins which was truly amazing. Thank you Khomba for a memorable holiday, we hope to be back one day. The perfect getaway with the family, friends or even solo. The rooms are luxurious, modern, very spacious, clean and homely, the staff is very accommodating. The service staff is almost invisible, the sense of privacy is huge, making you feel at home. The attention is perfect and the food absolutely delicious. Many thanks to Indrani and Sisira. A highly recommended place for a relaxing In fact everything one needed to make it a holiday to be repeated again and again. The lovely beach in front of the villa is ideal to relax your mind as well as body. We had a wonderful time at Khomba House, it was by far the best place to stay in Alankuda, you have created a little piece of paradise there. We were extremely comfortable and I slept like a child, lulled by the sound of the sea. It reminded me a bit of those meditation tapes of waves breaking. Photographs of sunsets, and recordings of waves never do justice to the reality and the deep coral sun set right in the centre of the horizon. The Indian Ocean was always warm, we swam at 7.00 am before breakfast till last thing at night. The climate was perfect, not too hot, a dry heat with a balmy breeze. Lovely to sit on the terrace to miss the midday heat and enjoy a little sleep on the daybeds after teatime. Sisira was a wonderful host and has the most delightful smile. We secretly nicknamed him Sinbad the Sailor. His wife's cooking was some of the best we sampled in Sri Lanka and we were beautifully and discreetly cared for.